What's Left After a D10? but I'm a lefty, who played it smart and learned righty. I did that. I sometimes wonder how good I could have become if I played the way that felt more natural. Not that I'm not having fun - I am! I think my daughter is actually right handed. She just started out lefty because it was different and I had the guitars to help her. When asked what hand did she feel more comfortable with, she chose right handed. This was fine by me because she was happy, she'll have more variety when she gets older and it's cheaper. This is moving away from my original post though. I chose left because it's what felt correct for me. I got a D10 because everything I read indicated they were a good guitar. Being left, it cost me more and I had to get one shipped in. This is something I'll have to deal with. My original post was more along the lines of, this is the end of the line for me with Washburn because there is nothing else for me to move up to. Pike noted the guitar I chose is expensive (I think I got it for a pretty good price, taking in that it is left handed). The Maton I have, is the bottom of the line in their range. Moving up, I can always get left handed models. This is one of the reasons I chose it. There is no Washburn (or many other brands for that matter)alternative. I did that. I sometimes wonder how good I could have become if I played the way that felt more natural. I paint signs and can letter equally well with either hand, but go righty for larger stuff (go figure). Learning righty felt comfortable to me right from the start. First guitar I ever picked up was righty, so I don't even know what it feels like to play lefty. I don't think it hindered me at all, and I imagine not you either Chris. Are management looking to change this? I'm a lefty, never touched a left handed guitar. But then, I'm not that good either, and I often wonder if playing lefty would have made a difference. I get lots of joy out of it, and that's the point. I can understand your point, Pining, of a lack of available models. Did you try a note to customer service saying what left handed models are available? It's conceivable that several are that are not marketed. they are out there, keep looking. It's a fair trip to the Washburn Factory. I still play my Washburn. It's harder to get a perfect note than my new guitar. I believe this is my incompetence, not the guitar, which makes it good for practice. To be honest, that bought a smile to my face. .......Until I had a nice long look at it. It's just a right hand with the bridge adjusted. well, maybe my ignorance here, but isn't the bridge the only difference between a righty and lefty dread? (plus the pick guard, where applicable) The bridge is cut opposite for intonation, but other than that, what's the difference? I have been told that the ONLY difference is that EXACTLY the bridge and the pick guard........... I almost bought a right-handed guitar and put a new lefty bridge and guard on it. They are easy to find in the Stew-Mac catalog. With that being said, I'm not sure that is a DIY project. the distance between the 12th fret and the bridge is critically important. Also there is a chance of ruining the finish when removing the old bridge. But any qualified guitar tech would be able to due this, but not sure how much they would charge. The differences would depend on the guitar. There can be few, or many. In the case of the guitar in question, it has righthand markings along the neck. 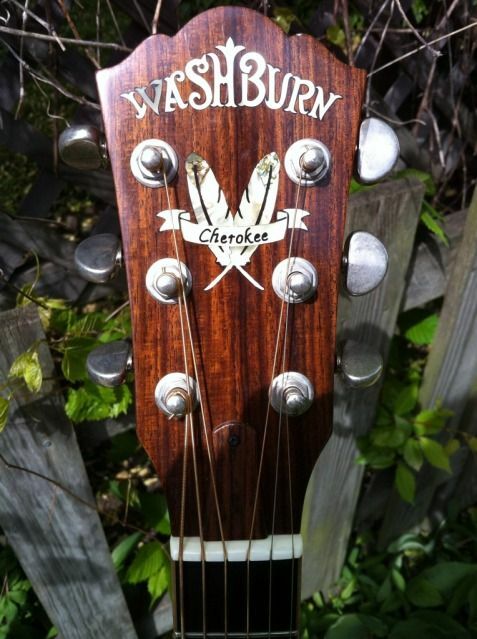 The pictures here show that Washburn do have beautiful saddles on some of its guitars.